A survey within the woodland to the east of Cliff End Battery has exposed two collapsed military structures. These turned out to be all that is left of five Position Finding Cells shown on the 1908 Ordnance Survey map (right). Their discovery has drawn attention to the unusual number and layout of the original arrangement, leaving interested parties a little baffled as to what purpose they could have served. 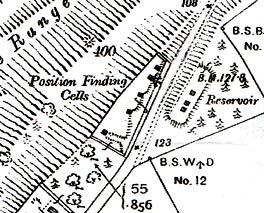 Position Finding Cells were first established in the late 1870s. They were designed to calculate the projected position of incoming enemy ships to guide the aim of battery guns. The cells were sited overlooking critical approaches. They housed charts and scientific instruments and were generally built to a high standard. The key equipment was the rangefinder; a stereoscopic device. Most coastal defences had one or two Position Finding Cells. The Needles Battery is a fine example, with two cells in good condition. It would seem that it only requires one cell to cover a particular approach. The Needles examples are typical in that they face different directions on either side of the battery. On this basis the Cliff End cells appear to make little sense, as there are five of them, grouped closely together and all facing the same direction. Equally strange is their location, overlooking a narrow passage in which passing ships are virtually within spitting distance: hardly a point at which sophisticated rangefinding calculations are required. So far nobody has been able to explain the arrangement with any certainty but, as always, there are theories. One suggestion is that it might have been some sort of training facility, practising on incoming commercial shipping or perhaps using the known the position of mainland landmarks. An alternative theory is that they were for experimental work. Maybe they were used to test different rangefinding equipment simultaneously, under identical conditions. By the end of the 1880s the military had become somewhat disenchanted with available rangefinders and ran a competition inviting companies to submit new designs. Was it here that the tests were run? The council's Conservation and Design Department has being trying to encourage the public to nominate buildings or features for inclusion in a Local List of historic sites worthy of formal recognition, albeit falling below the requirement for national Grade II listing. So far the response has not met expectations. The Local List is being established by authorities across the country to supplement those structures already listed and protected nationally by English Heritage. The list will have no statutory protection but is designed to formally acknowledge the existence of a range of features that are considered to be important locally. Once established, they will be considered in the review of planning applications, although they will presumably carry less weight than those with national protection. Features can be anything from post boxes to buildings or parks. Applications for inclusion are made to the Conservation and Design Department where they are then submitted to a panel of local historians who make the ultimate decision for inclusion. A set of criteria has been published to act as a guide, although the best advice to applicants is, if in doubt, submit it. So far many of those items submitted have been from the Conservation Department themselves. Very little has yet to come from local history organisations or individuals. The council is now making a strong plea for more people to become involved. The council website has a page which explains the system and provides a link to an application form. If in doubt as to whether the item is already listed by English Heritage, check out the Island's existing protected structures. Of course some items have already been established on the Local List. If you want to see what is already included, the council's Conservation Department will supply details. Leprosy was a common scourge of the Middle Ages and, by the end of the 12th century, the hospitals were an established practice in England. The medieval leper hospital was really a hospice, as few of its inmates survived. The contagious and disfiguring nature of the disease rendered its sufferers outcasts, so the hospitals provided both isolation from the general public and prayer for the souls of sufferers. They have traditionally been represented as hopelessly grim places, although some historians now suggest life in them was no worse than in the average monastery. The Carisbrooke hospital was established by St Mary's Priory, probably in the 14th century. The precise location is unknown. A position is marked on some early maps, at the northern extreme of the priory lands, but the maps are unlikely to guarantee anything more than an approximation. Whilst the general layout of buildings within some of the country's larger hospitals is documented, it is not at all clear what a particular provincial example would have involved. It is unknown whether the site will contain burials. The archaeology is being organised by County Archaeologist, Ruth Waller. A programme has been planned involving members of local organisations. This will be a hands-on community project in that volunteers will be doing the excavations themselves. A geophysical survey has already been carried out within the general area. The results show interesting anomalies indicating the remains of a collapsed building, and this will form a guide for the first trenches. Of course, centuries of subsequent activity could mean the survey is just highlighting the remains of old farm structures. Building materials alone are unlikely to be conclusive, so identifying the hospital will probably come down to the dating and context of excavated artefacts. The geophysical anomalies show a major spread on the left and a minor feature at top right. The latter might indicate the extremity of the hospital grounds.